In 2011, Alex Koenig looked at the factors that affected attendance rates in college football. He concluded that sustained winning and undergraduate enrollment were very important to the capacity of the stadium. I looked to investigate the different factors that affected college football attendance rates at the FBS level from 2010-2014. Specifically, I was curious if the quality of education a school has affects the home football attendance rates. I gathered information from Naviance in these categories: undergraduate enrollment, school acceptance rate, average SAT score of students, instate tuition, out of state tuition, registered organizations, honors societies, fraternities, sororities, public vs. private, city vs. town, religious affiliation, and SRS. SRS, a simple rating system created by sports-reference.com which acts as a measure of team strength. An assumption was made that average SAT score and acceptance rate are indicative of the quality of the education a school offers. There were two different regressions run; one was a stepwise regression on the effect of those different variables on the home attendance rate, the other was a stepwise regression run on the effect of those different variables on the log of the home attendance rate. Variables were removed at the 5% significance level. 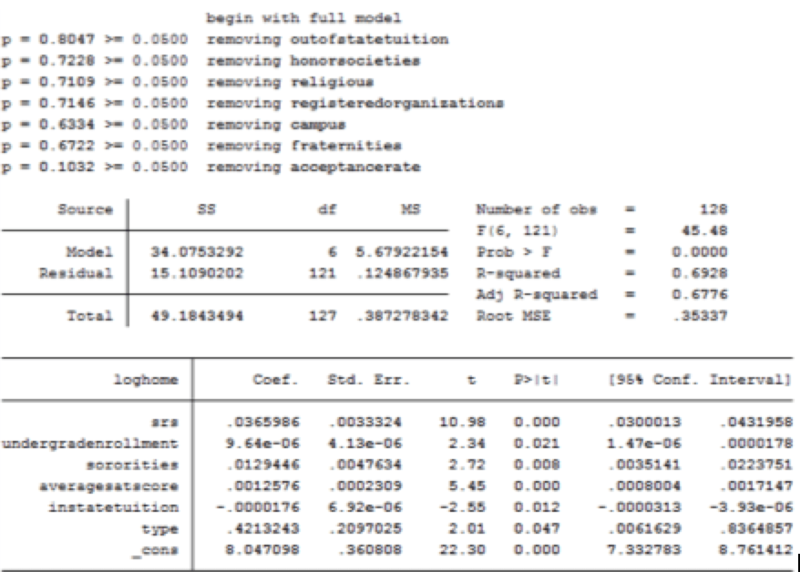 This regression shows that the remaining effective variables were SRS, undergraduate enrollment and average SAT score. 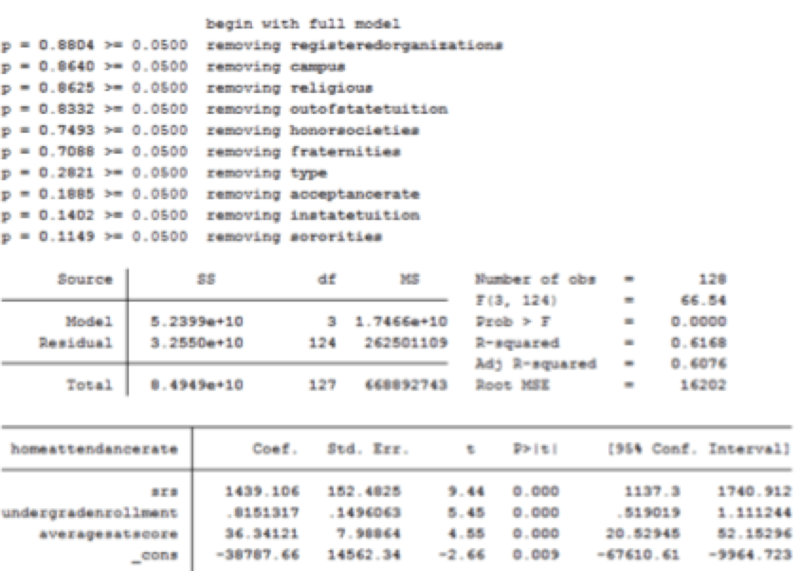 The effect of the enrollment and SRS are consistent with what Alex Koenig found in 2011. The average SAT score shows that the quality of the school (and its students) has an effect on the home attendance rate. It is interesting that the average SAT score has a positive effect, meaning that schools that are perceived to be better, with all else held constant, would have a higher attendance rate. This regression includes the same 3 variables from the last regression (SRS, undergrad enrollment, average SAT) and also shows the number of sororities, in state tuition and public vs. private. Rather humorously, the number of sororities on campus has a positive impact on the home attendance rate. It’s also of note that the instate tuition has a negative effect, meaning, with all else held constant, a more expensive school is correlated with a lower attendance rate. The average SAT score had a positive coefficient in both of these models. I had hypothesized that a school with higher standards of learning would have a lower attendance rate. Being a student of a school like Harvard, where an editorial written in the school newspaper actually called for the disbandment of the football team, this surprised me on two fronts. The first is that with the rising amount of knowledge about concussions and their lasting impacts, more educated students might become less enticed by the game, knowing what it truly does to the players. On a second level, I thought that students at higher level schools would be busier, and have less time to watch football. This model suggests that either those assumptions are wrong, or there is some confounding variable we have not yet accounted for. Does Senior Day Matter in College Football? High average SAT scores are probably driven by a school having a high number of applicants (relative to school size), and therefore being able to be more selective in what applicants they admit. A school having a high number of applicants (again, relative to school size) is an indication that it’s more popular, that it’s more desirable to go there. If a school is more popular & desirable, the students may have more “school spirit”, and be more likely to attend games. But perhaps more importantly, the general popularity of the school itself could drive non-students to attend games. In other words, I suspect that some difficult-to-measure concept of “school popularity & desirability” is a contributing factor to both the high football attendance and the high SAT scores.